Mayday Grounding, Inc. Distributor of Cadweld, Burndy and Panduit, AEMC, ERICO and XIT, custom ground bars and forms, ground system tools and accessories. We are committed to providing superior electrical grounding products for industrial, commercial, and construction businesses. The valuable advantages we can offer you are great service, extensive inventory of high quality products, and a highly trained experienced sales staff. Our products cover everything from ground rods (stainless steel and copper clad) SRG (signal reference grid) GEM (ground enhancement material) lugs, dies, hydraulic tools, custom bus bar to blueprint take-offs. No matter what your electrical grounding needs are, we have the right solution at the right price. We are the largest individual Cadweld and Burndy stocking distributor nationwide. We are proud to offer the comprehensive line of ERICO and Burndy high quality products to meet your system requirements. Due to our extensive inventory, most orders ship same day. Along with a full line of grounding accessories, we are experts at making custom ground bar systems to your exact specifications. Our commitment to customer service and education goes beyond industry standards. Our continuous search into grounding technology enables us to meet any customer’s challenge. We pride ourselves on the excellent word of mouth promotion that we receive. We have large repeat customer bases who know they will receive prompt, efficient service from our team of technical advisors. We use the best quality products and provide you with the back up and support service that you deserve. Our customers benefit from our superior service. We adhere to strict employment of our operating principles for system improvements, client satisfaction, cost and quality controls. Honesty, integrity, fairness, and loyalty influence our daily operations and long term strategies. We look forward to the opportunity to earn your repeat business. Cadweld exothermic welded connections are permanent, corrosion resistant and require no outside source of heat and power. Includes standard exothermic welded connections, low-emission connections for enclosed areas, and disposable one-time use connections, plus a variety of accessories to fit all application requirements. Stainless steel and UL listed copper clad ground rods are in stock and ready for pick up. Each rod is perfectly bonded to last longer, drive easier, and will not crack. Accessories including grounding clamps, couplers, and, driving sleeves are also available. All products are manufactured to ISO standards and are UL listed. Burndy high-compression, mechanical connectors put the bite on aluminum or copper connections. We carry a full range of Hyground compression grounding system connectors, NEC cable connections and tooling. Hydraulic tools are available for rental or purchase. Pre-engineered bonding and grounding grids include our SRG (signal reference grid) for sensitive electronic equipment that eliminates the effects of transients or electrical noise and our prefabricated wire mesh for improved grounding of high voltage installations of where large ground areas are required. Blueprint and project take-offs are available. Our edjucated staff will assist you in determining a list of materials required to complete your project. From computer rooms to communication towers, Mayday helps you get the job done. Custom ground bars – We are experts at making custom ground bars to your exact specifications. In our never ending quest to serve you to the fullest, please do not hesitate to call, write, or email us with any of your problems or concerns. In fact, even if you were completely satisfied, we would love to hear from you. 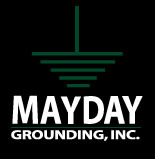 Thank you, Mayday Grounding, Inc. Copyright ©2010 Mayday Grounding Inc. All rights reserved.